Parenting for Life Group Coaching supports parents, children and families. Reserve your seat now! Practical and powerful, Parenting for Life offers parents with children of all ages tools to strengthen and heal their relationships. Learn how to strengthen your parent-child relationship with love, understanding, and strength for life! The relationship between parent and child is a significant and life-changing one in the life of and infant, toddler, preschooler, school-aged child, middle-school child, teen, and adult child. The parents history, role, and responsibility impacts a lifetime. The way you relate and feel as a parent is also life-changing for you. If you are parenting or co-parenting raising or relating to children and/or teens–you are welcome to explore, sharpen your skills, and enhance your parental toolbox. Parenting for Life Group Coaching is a six-week coaching and support group led by internationally prestigious Mom’s Choice Award-Winning Author Nina Sidell. 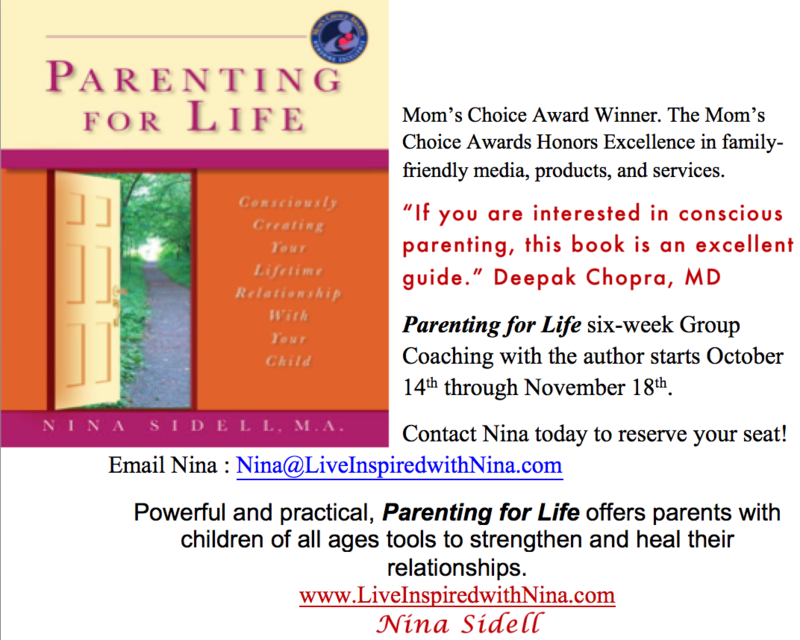 ” If you are interested in conscious parenting, this book is an excellent guide.” Dr. Deepak Chopra. Individual or coupled parents can register using the Pay Pal drop-down menu below. Another group will be forming for adult children needing to discover, forgive, and heal their relationship with their parent(s). Please ensure to make payment before the deadline date accompanying the next coaching series. 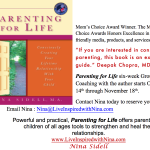 Bring a copy of Parenting for Life book to each group coaching session. You can purchase a signed copy from Nina on the first meeting if you don’t have one. Also bring a parenting journal notebook or journal book, a pen, and a pencil. SAVE YOUR SEAT PHILA. PARENTS! “Parenting for Life” Group Coaching starts in one week. Attention Philadelphia Parents~ Parenting for Life Group Coaching Starts Wed. October 14th! 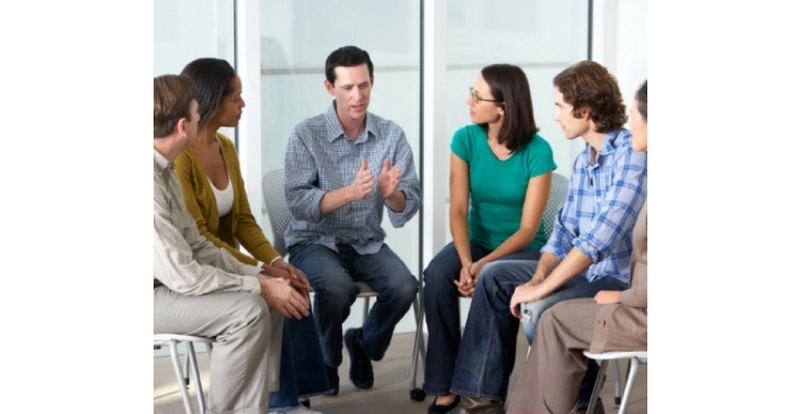 Save Your Seat Now~ Six-Week Coaching and Support Group in the Philadelphia area. Individual or coupled parents are welcome to attend. If you are contemplating parenthood, expecting, raising, or relating to children of any age and stage of development, you are welcome to attend. A copy of the book, Parenting for Life is needed by the first session and can be purchased with a signed copy from the author, Nina Sidell. To Register and for more Info. :http://www.LiveInspiredwithNina.com Contact Nina @: http://Nina@LiveInspiredwithNina.com or call: 215-628-0282. I am here to help you live your best life yet! I’m enjoying expanding my horizons professionally. Come say hello to me, share a hug or a handshake with me and get your signed copy of, “Parenting for Life” this Saturday, October 3rd at the Paoli Blues Festival! I will be signing books and meeting as many people as I can. I am looking forward to talking with parents, co-parents, children, and adult children who feel inspired to say hello or ask for support. I am offering my professional services as a therapist, life coach, speaker, and new Award-Winning, Deepak Chopra endorsed author to the community locally and at-large! It’s so much to build up and take in and it is an amazing journey! I appreciate your support guys.I am thankful and hope to do my part as people expand and the world begins to heal. I intend to educate, encourage, and inspire parents, children, and families worldwide! I will be taking sign-ups for “Parenting for Life” Group Coaching which starts on October 14 for a six-week program led by me- the author of the book and new niche’ in parenting– the practice of lifetime parenting. Learn more and register at: www.LiveInspiredwithNina.com and register to save your spot! I am here to help you live your best life yet. Parenting for Life Book Blast Off! Greetings guys! I am sharing my deep gratitude and thanks for all of you who are my friends, family, clients, colleagues, love workers, and those I do not know as well- but whom we share a positive connection! It is good to share this journey with you! Soon, I will be stepping out into new terrain on my professional path. It is very exciting and I am going for it! It has been a long, arduous, and fulfilling process. It’s time to shine!